This last week, as a part of the start of my book promotion, I got the wonderful opportunity to help judge the World Championship Dutch Oven Cookoff! Here are some thoughts on competitive cooking, that I excerpted from my book, "Best of the Black Pot: Must-Have Dutch Oven Favorites ". Here I am, tasting the desserts! It seems like half the cooking shows on TV these days are competitions. Even the cupcakes have wars, now. My son loves to watch them all. While I admit that sometimes I can get caught up in the drama of the moment, for the most part, I’m not so much a big fan. I’ve been a competitor in dutch oven cookoffs as well. The two salmon dishes in this chapter were my cookoff recipes, as I competed. Here are some of my random thoughts on competitive cooking. The people who do cookoffs are really good Dutch oven chefs. This is especially true of the World Championship Cook Off, but all of the competitors I’ve seen, even at small, local cookoffs, are really good. I’ve been very impressed. The people who run dutch oven cookoffs work really hard. Organizing and running a cookoff is some seriously hard work. Setting it up, promoting it, getting sponsors and prizes, scheduling the judges, and many other tasks, make it a very time consuming challenge. Usually, it’s done for free. My hat’s off to these people. Having said all that, I’m not a big fan of competing, myself, because I don’t seem to do well. I can cook under pressure, even under tight time constraints, but for some reason, when I compete, I choke. A good example is the blackened salmon. I did a practice run the week before, and it was incredible. The timings all came out right, the salmon was to die for, and each of the other dishes was perfect, too. Then, the morning of the competition, it all fell apart, and I made mistake after mistake. It was a mess. However, I’ve talked with others, and they say that the pressure makes them cook better. It makes them develop their best recipes, and hone their techniques. Dutch oven competition is always friendly. One thing I have seen constantly is how friendly Dutch oven cookoffs are. I don’t see the viciousness or the backbiting that are so prevalent in other competitive events. I’ve seen contestants share tools and ingredients with each other, and they’re always swapping stories and recipes in the downtime. 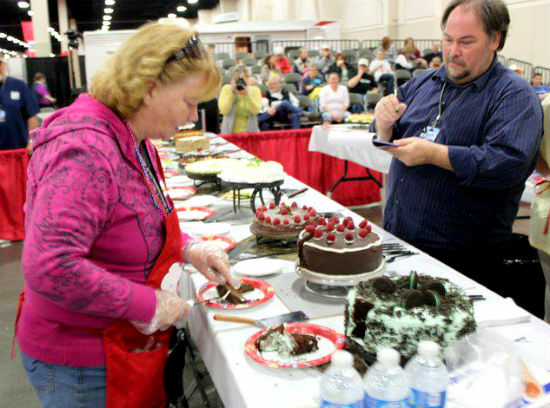 One of the challenges with cookoffs has to be the judging. It is challenging to compare dishes against each other. I mean, we are talking apples and oranges, here. Literally, in some cases! Is this one a better apple than this one is an orange? What’s the basis for comparison? Sometimes, I don’t envy the judges their jobs. Judging any kind of creative endeavor is difficult. It’s made particularly difficult by the fact that, as I mentioned before, those that tend to participate in Dutch oven cookoffs tend to be good at it. So, as a result, you have to draw the line between varying dishes that are all top quality. How can you call a winner? There are a lot of things other than the final product that add up into your final score. First of all, in addition to the tasting, the garnish and presentation is a part of the score. In addition, how you present the food can pre-condition the judges opinions of your dish. Also, there are people called “field judges” who score you on your time spent preparing the dishes. If your preparation area looks cluttered, disorganized, or even dirty, you can be marked down. Many people will bring fancy tablecloths and other bits of decor for their preparation areas, and they often will get higher scores for that. How you interact with other competitors and with any spectators could be factored into your score as well. There are some “standard dishes” that tend to win cookoffs. While variety and innovation are a good thing, they don’t tend to win cookoffs. Ribs are very popular, as are roasts of both beef and pork. Stews and chilis don’t do as well, because it’s a little more difficult to find a great way to present them visually. I also haven’t seen chicken dishes win as often. International dishes, like asian cuisines or pastas also don’t tend to be as popular. Exotic dishes that the judges would be unfamiliar with could also be more challenging. That doesn’t mean that you shouldn’t try these. It does, however, mean that you’re up against additional stress to prove your dish is great. Make it incredible, and make it look great, and it could win out! Planning and timing are a BIG deal. In either case, you’ll want to plan your cooking so that each dish will be finished, garnished, and ready to present to the judges right at the time when it’s due. If you have it finished too early, it won’t look as fresh and won’t be at the peak of its flavor. If it’s done too late, you might have to present an incomplete dish, or might even be disqualified. So, begin with the end in mind. I created a spreadsheet and planned out each phase of each dish, counting backwards in time from the presentation deadline. That way, at any given moment in the competition, I knew what I needed to be working on. One of the biggest mistakes I made in my cookoff experiences is that I cooked alone. First of all, pulling off three dishes in three hours to competition quality is crazy for a single person. Second, having a friend there with you is a lot more fun. Even with my own difficult experience in cookoffs, I really think that at some point, everyone should do a competition. It’s a wonderfully unique experience, and you’ll learn a lot about yourself and about Dutch oven cooking by doing it. Go into it for the experience, not necessarily for the win, if you have to. Do your best, and have a great time.